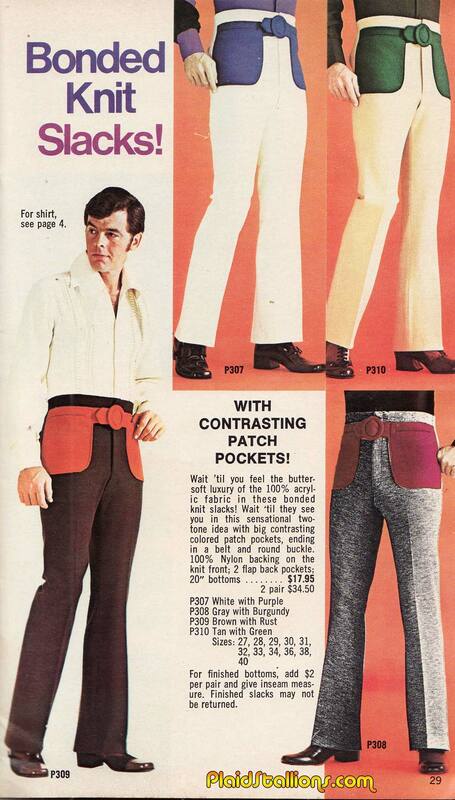 Someday our Children's children will look down at us and our silly non contrasting pockets as if we were cave people. 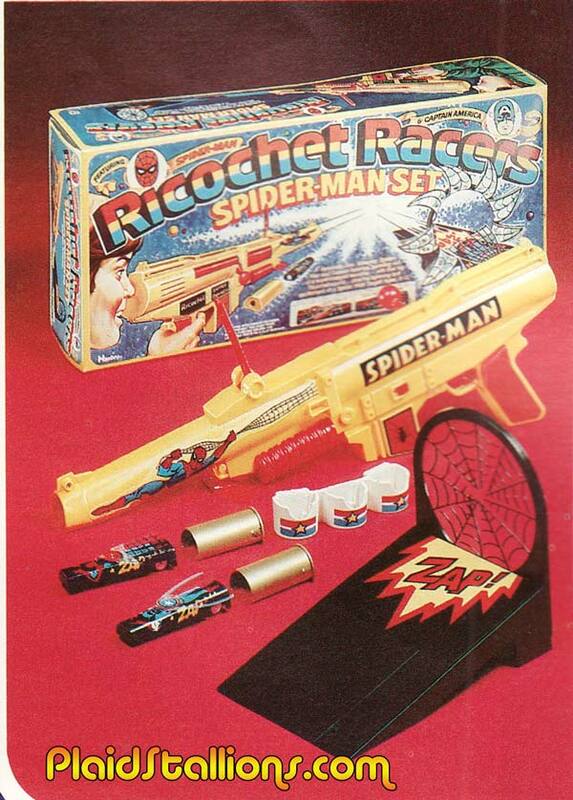 Ricochet racers were a cool concept on their own, it's a neat looking laser gun looking rifle that shot cars! Sprinkle in Spider-Man and Captain America and few kids could resist them. This was a yard sale find I gave my son many moons ago, it was enjoyed and all that remains appears to be this box lid. 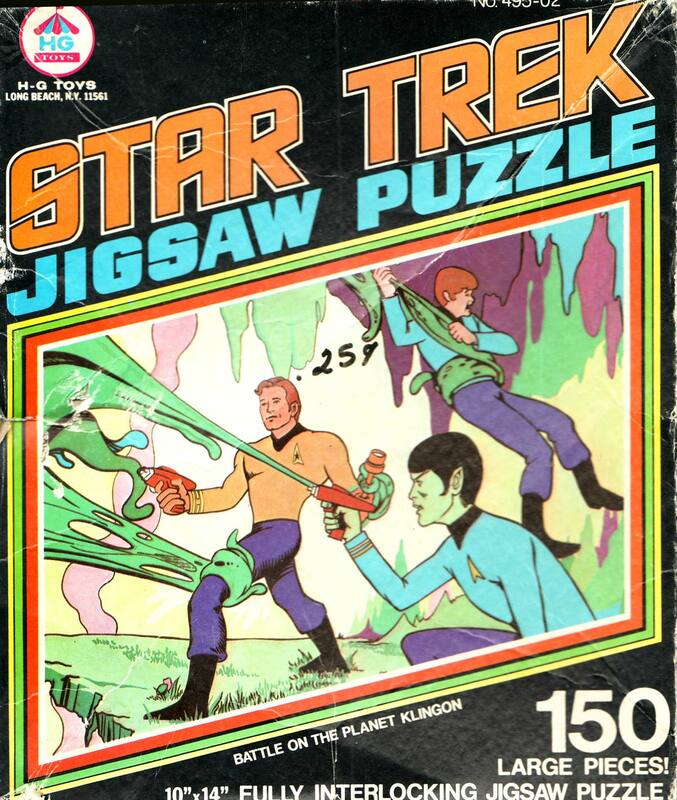 At one time, the off model green Mr Spock would have annoyed me, now I like it better than most merchandise produced today. It took me by complete surprise this week that it has been nine years to this day that I decided to start this blog. Many thanks to my then infant daughter for taking a long nap on April 26, 2006 (she doesn't take so many these days) and giving me the time to begin this journey. I really have to thank all of you for making this experience a dream, for commenting here and on the facebook page, for writing in, listening to the podcast and for making my book a success. I am eternally grateful for the friends I've made and experiences I've had through this site. 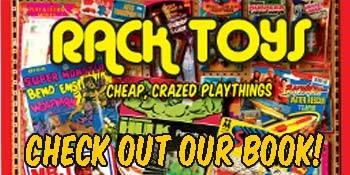 Create a Rack Toy Contest! 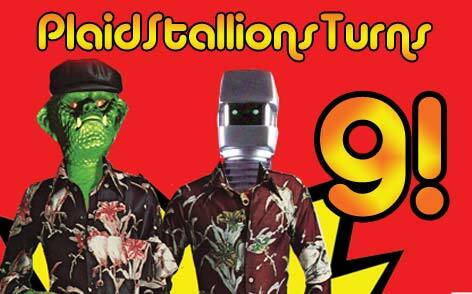 I've done contests here before but this one was cooked up by my pal and podcast partner Jason Lenzi and it's brilliant. 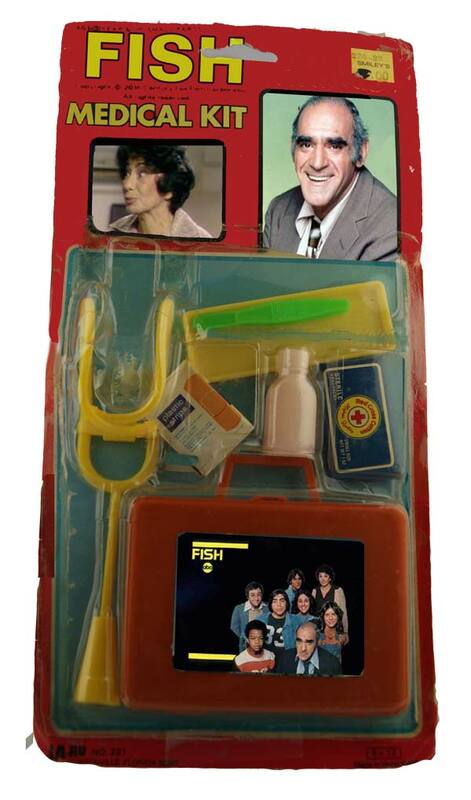 Concept: Pick the most inane 1970s TV, comic or movie property you can think of and marry it with the most inappropriate rack toy you can think of. 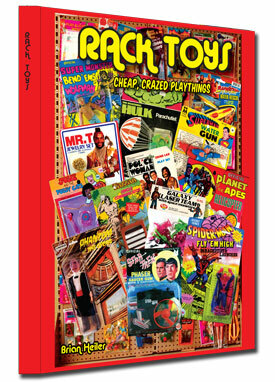 Email your best idea (no design work needed) to kid70s *at* gmail.com (replace the *at* with an @) I'll pick the winners in Mid May and I'll even try to mock up the three best in photoshop like I have done above. 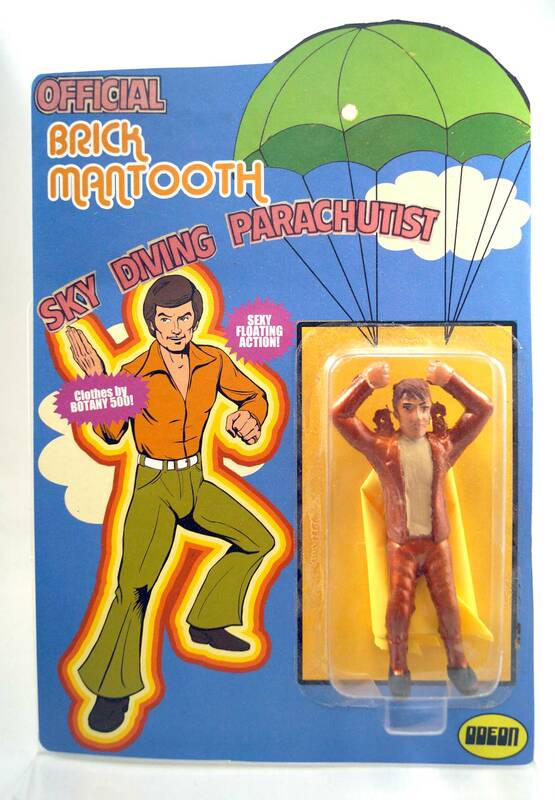 1st Prize: An Official Brick Mantooth Sky Diving Parachutist Figure Mint on Card. Thanks again to everybody for reading, listening, supporting and joining in on the fun, it's made my life better. 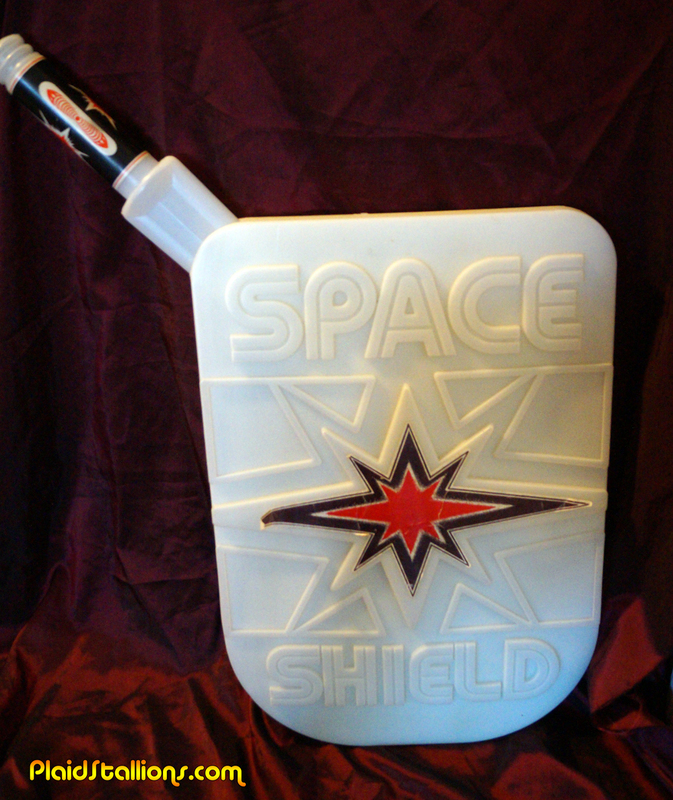 I kind of got giddy finding this ammo pack for the Star Trek tracer gun. 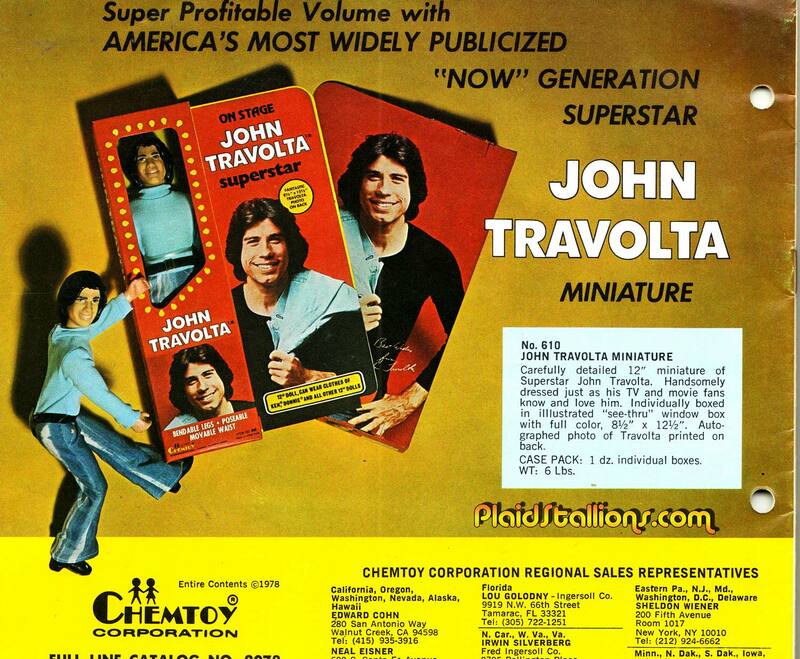 I didn't even notice that there is no mention of Trek on the package. 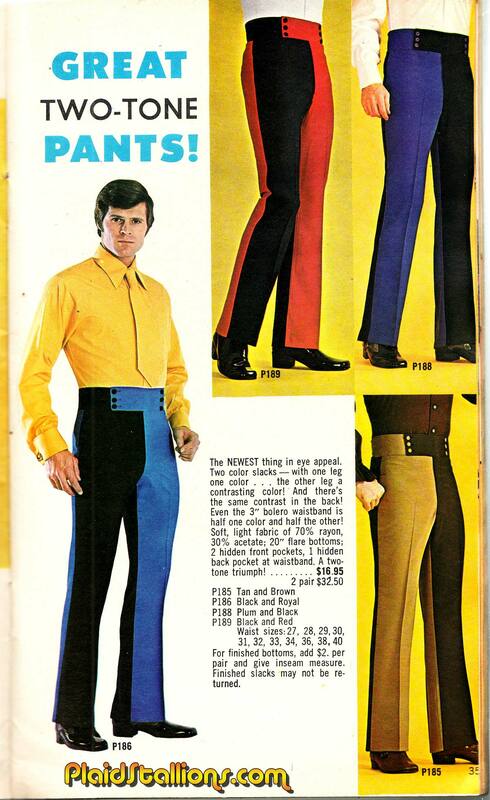 Finally, an end to the Hitler-esque oppression of Mono-Tone pants. Poster and marker sets were one of my favourite ways to spend an afternoon as a kid (cause that's about how long the markers would last). 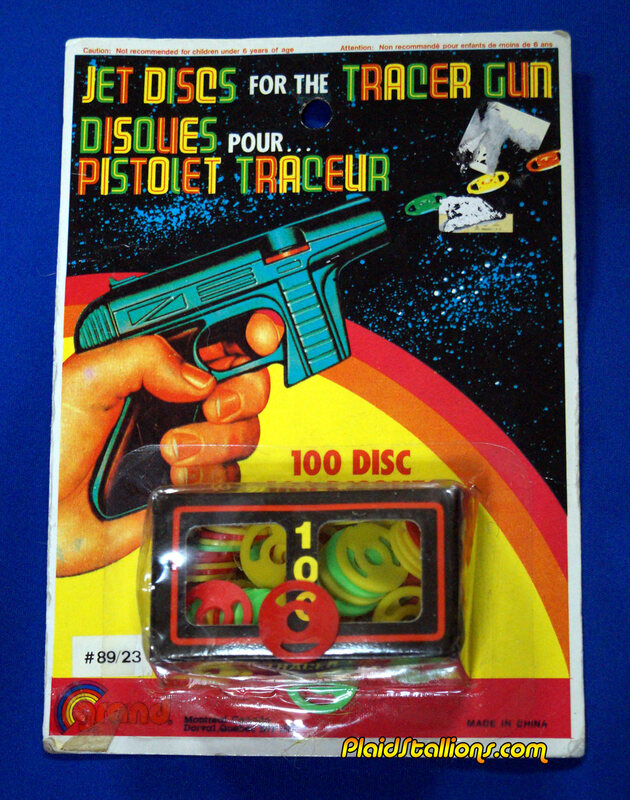 I also recently have become invested in tracking down all the ones I had as a kid. 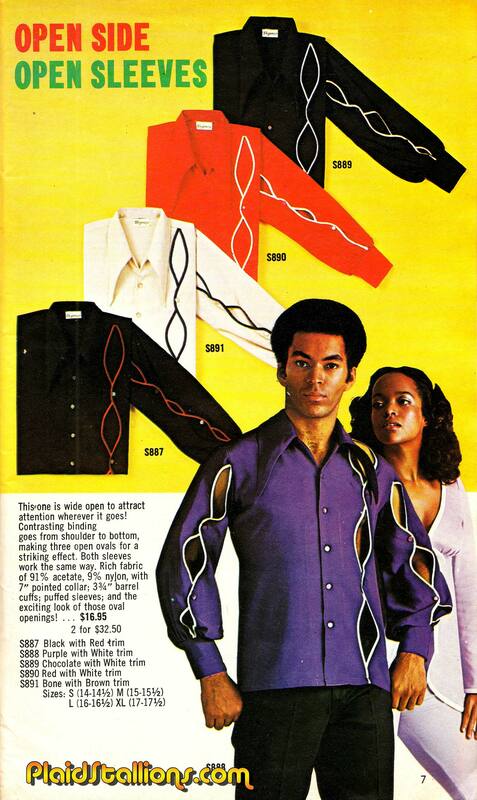 Check out the 1979 Craftmaster Catalog. 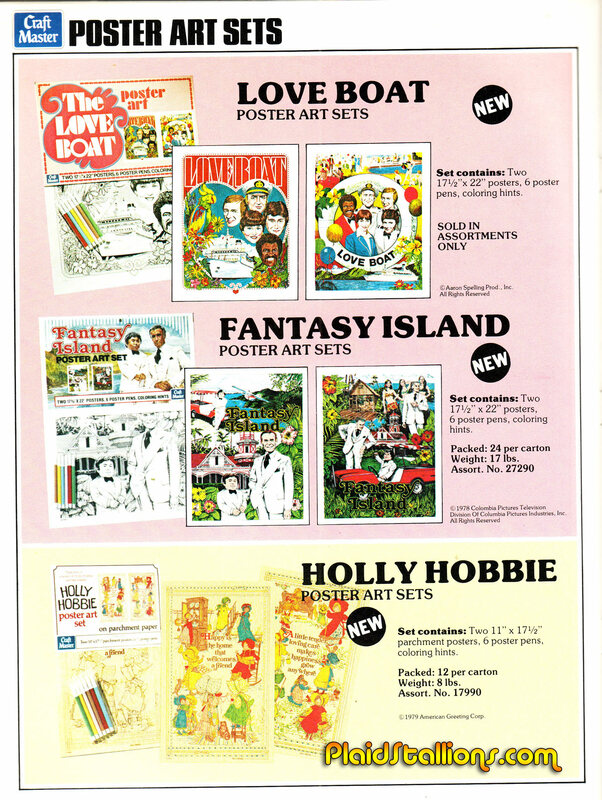 I'd also like to add if you have the Fantasy Island set for sale, CONTACT ME!!!!! I'll be honest, I've never looked this cool in my whole life. This past Sunday the first thing I saw when I entered GTA Comic Con was my pal Dana wearing a Magic Mongo T Shirt, which is a sentence I never thought I'd ever type in my life. 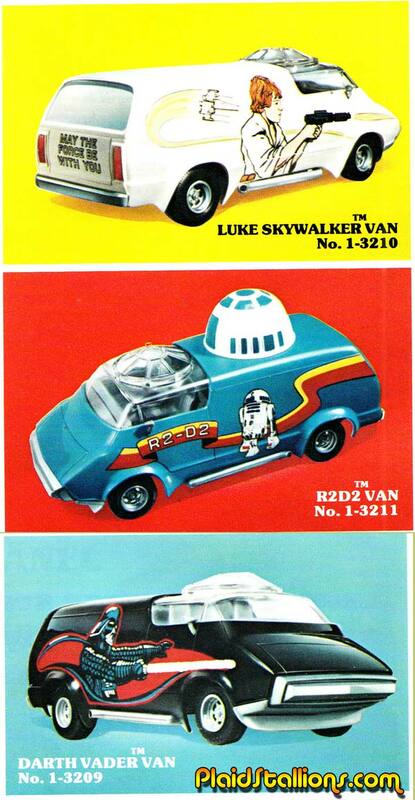 Is there anything more 1970s than the mixing of Star Wars with vans? It was my dream as a kid to grow up and get my own groovy van. 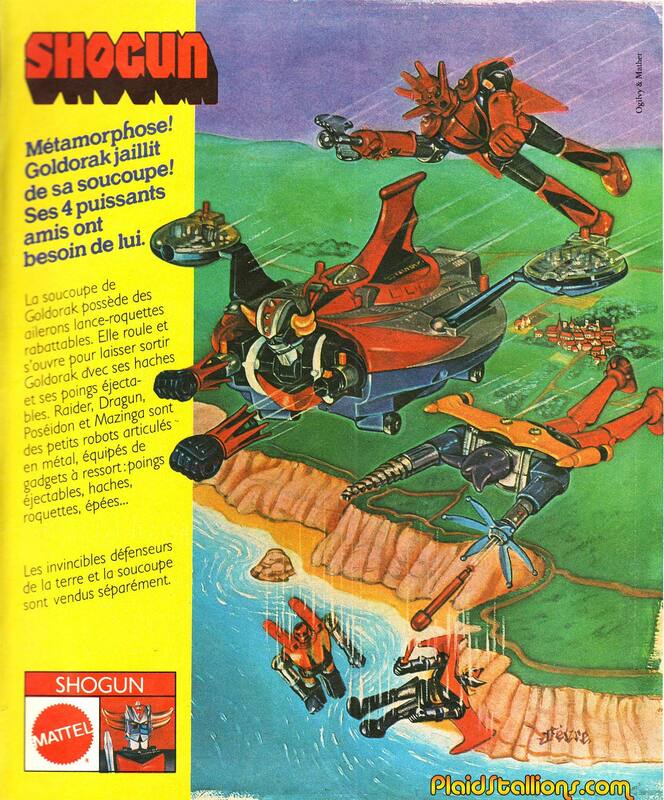 I end this week with this little bit of wonder from France, where the line was simply called "Shogun" and featured Goldorak. I ask you, what is not to love? This ad refers to Raider (not Raideen), Mazinger, Poseidon and Dragun as his "Strongest Friends", love it. 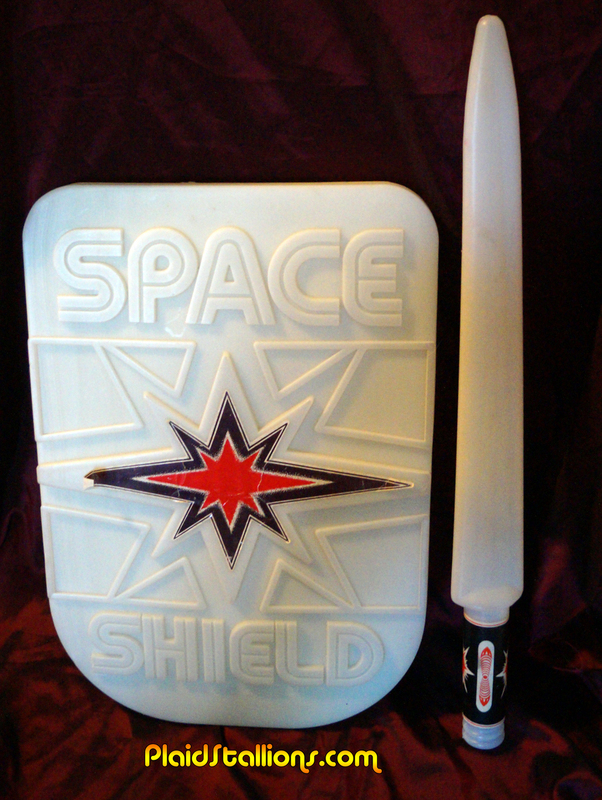 Oh and the invincible defenders of the Earth are sold seperately. 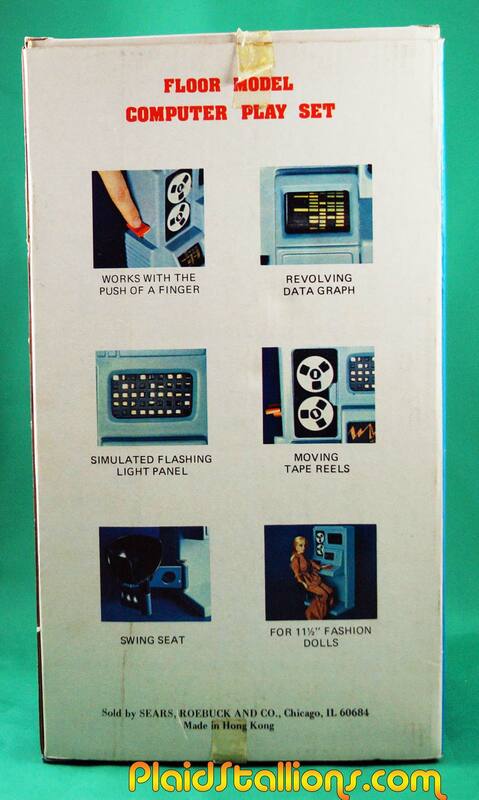 I finally tracked down a toy I've been after for ages. 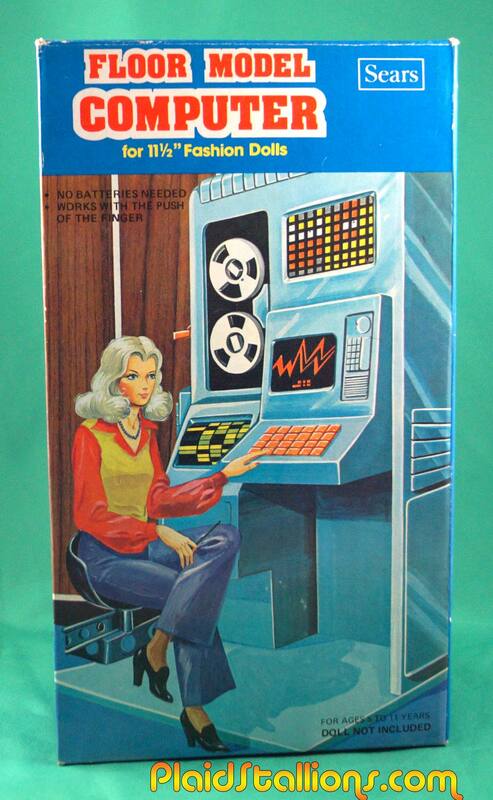 Made by Sears and sold in the fashion doll pages this toy hits on something I love, OLD TIMEY COMPUTERS. 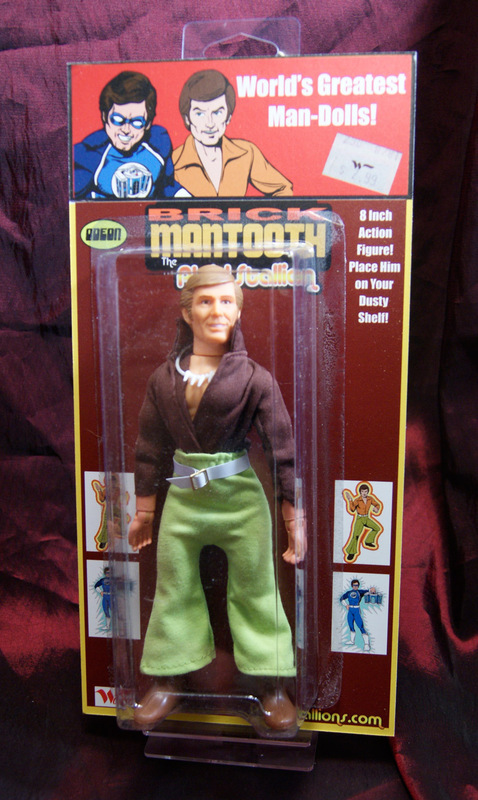 I'd have to say that this was not meant as an accessory for Barbie but more for the Bionic Woman and Wonder Woman figures of the day. 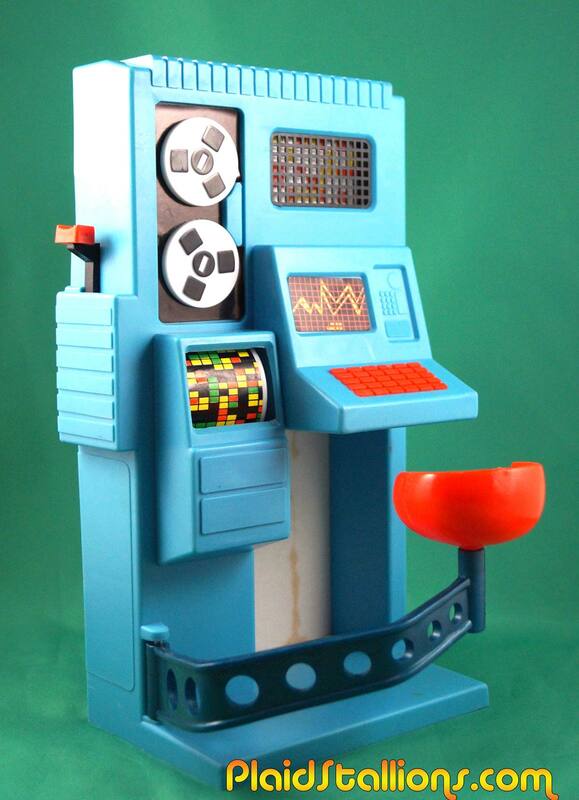 You may notice a lever on the side, even though this thing takes no batteries, it does produce an effect that has to be seen to be believed, so i made a (1990s cable access show quality) video. 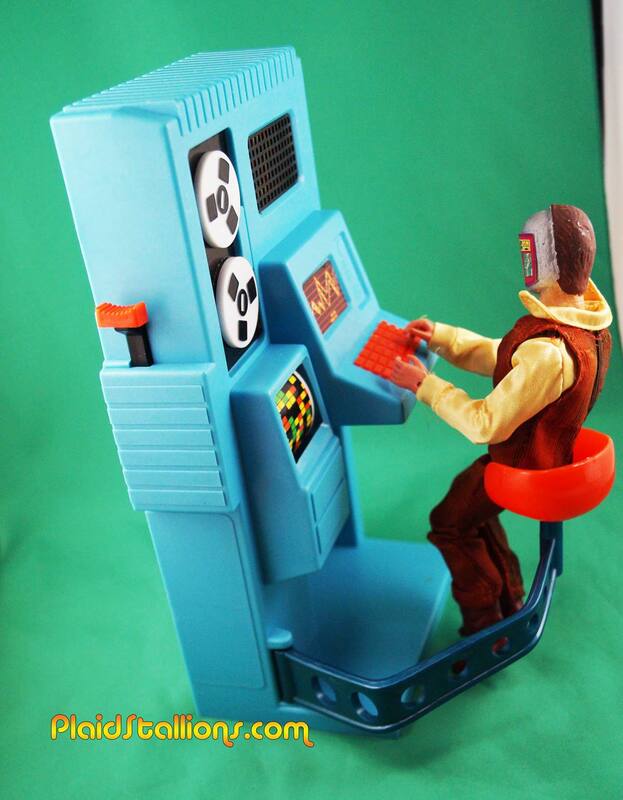 Did I mention it works just dandy with mego figures? And just to prove how cool a toy this is, my daughter has asked to play with it twice this week. I'm not made of stone. There are more in this series, one even features a wood panelled office, hopefully i can find them. 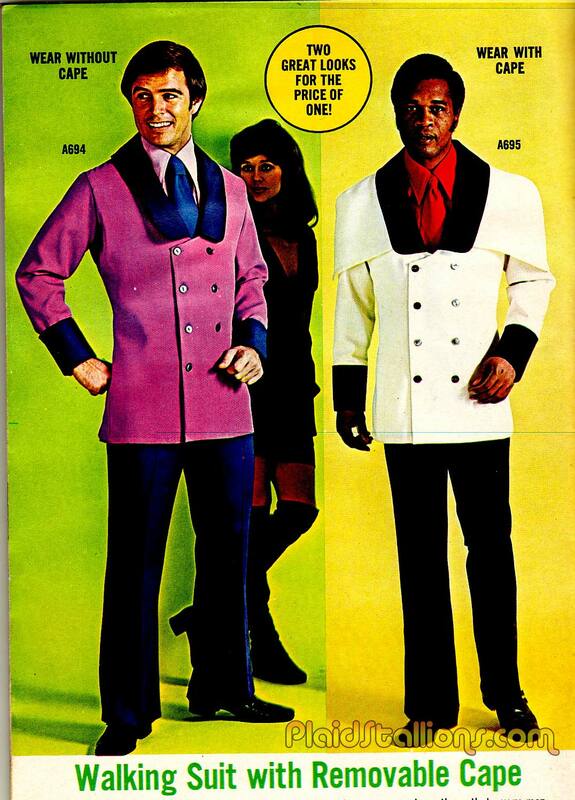 I guess it's nice that it's removable but honestly, I can't think of an occasion where a cape is too formal. 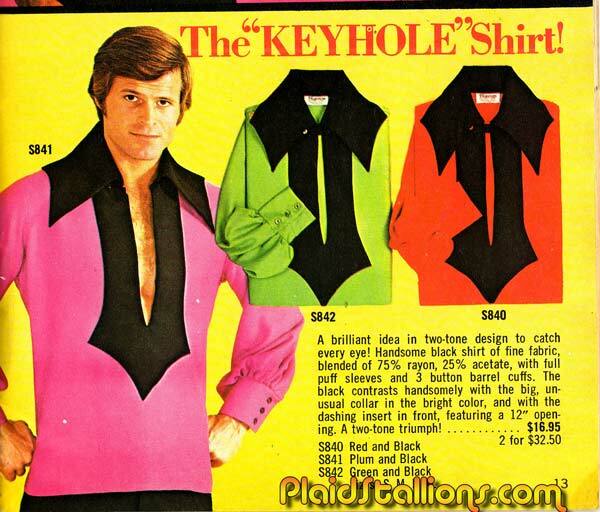 It's kind of like monocles, right fellas? 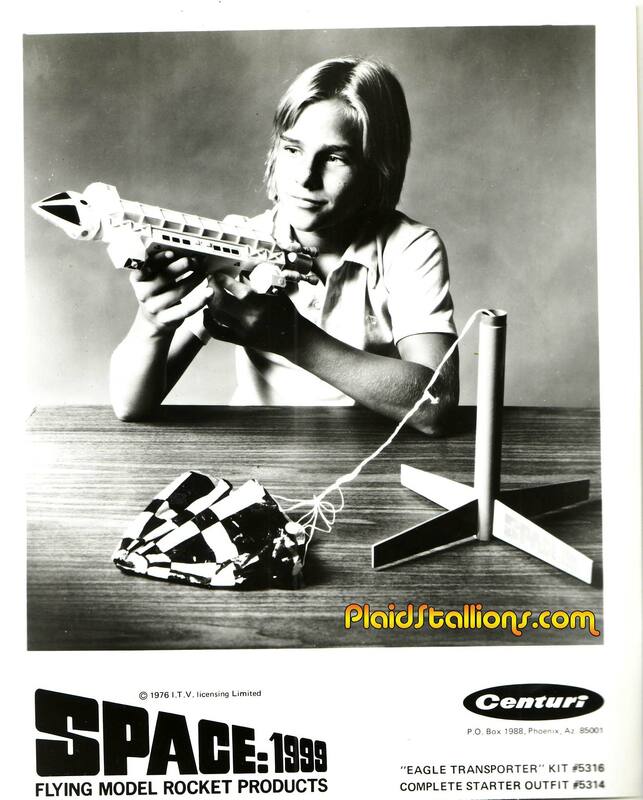 I found this promotional photo here in the stacks, I ALWAYS wanted to get into these flying model rockets but even when i was 8, I knew I wasn't "that kid". Finally! 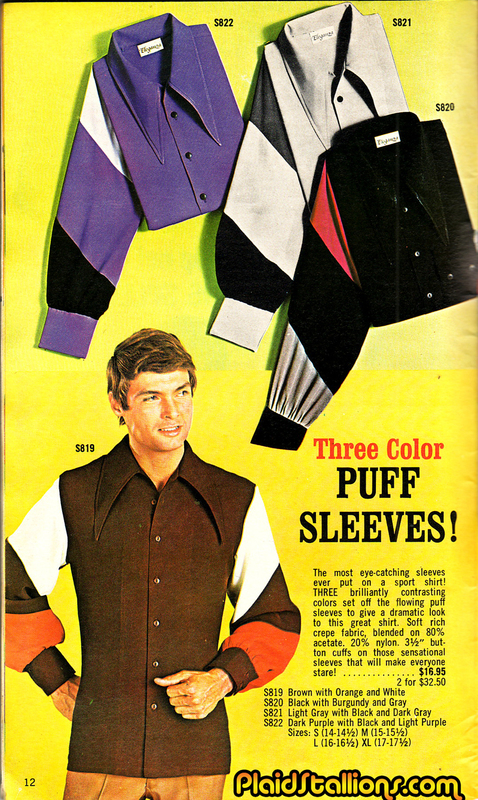 The trash is now filled with my inferior dual coloured puff sleeved shirts. 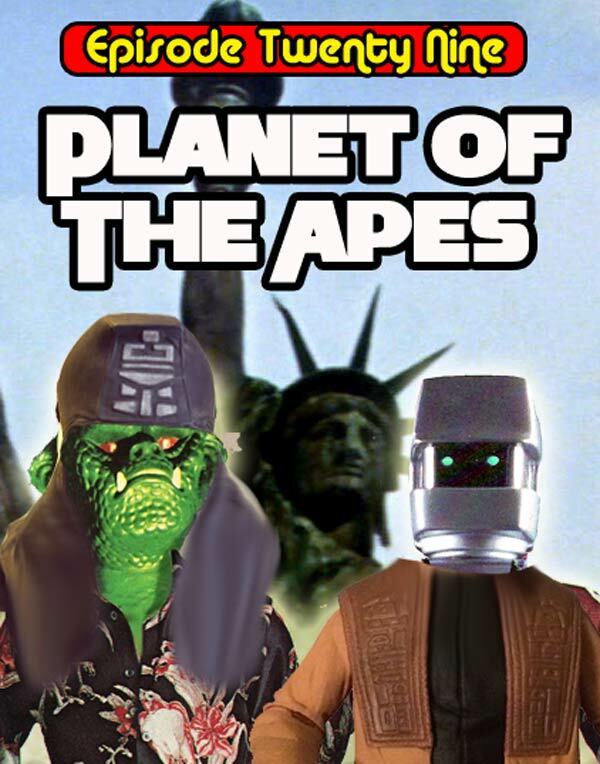 It's been a long time coming, the first foray into what is the quintessential science fiction block buster of the early 1970s, the Planet of the Apes Phenom. 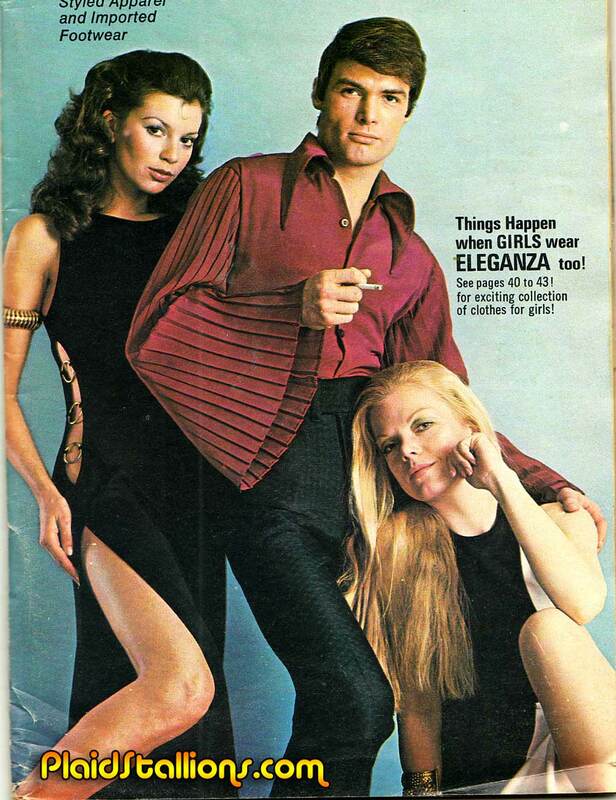 Episode 1 deals with the first movie (we're going to take our time with this) and brushes lightly on the actors, the makeup, the script, our man crushes on Roddy McDowell and why the film had almost no merchandise when first released. We also take our normal diversions like discovering Jason was on Deep Space 9 (! ), Malcom McDowell knows his movie trivia, why Brian hates bowling for dollars, Mego toys, Rex Harrison, MST 3K and a Man called Sloane. 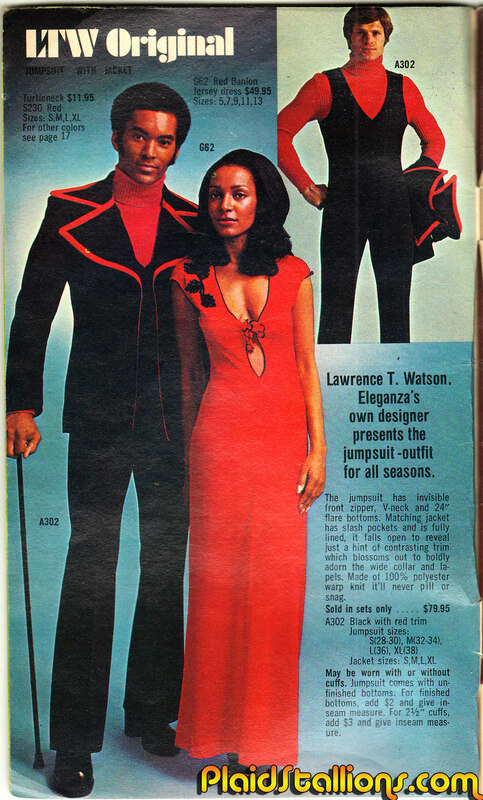 Gentleman, this jumpsuit will make you more delicious than the candy this holiday weekend. 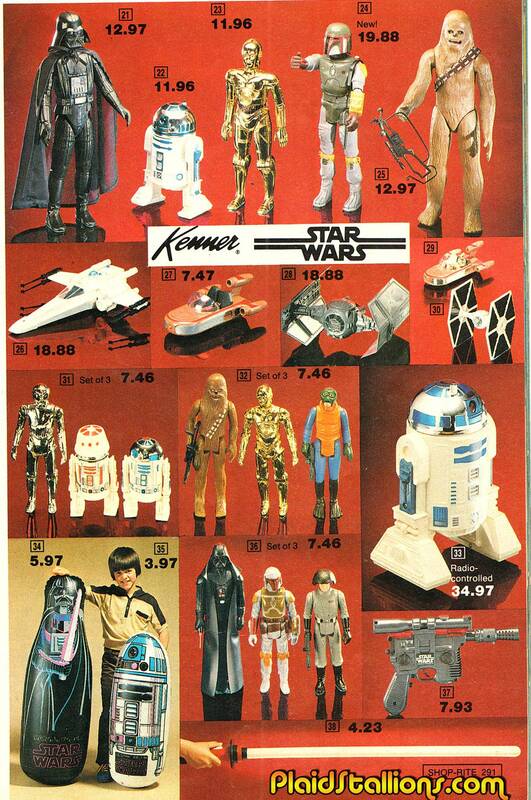 It's weird to think that there was a time where this page held 25% of all Star Wars merchandise in the world. 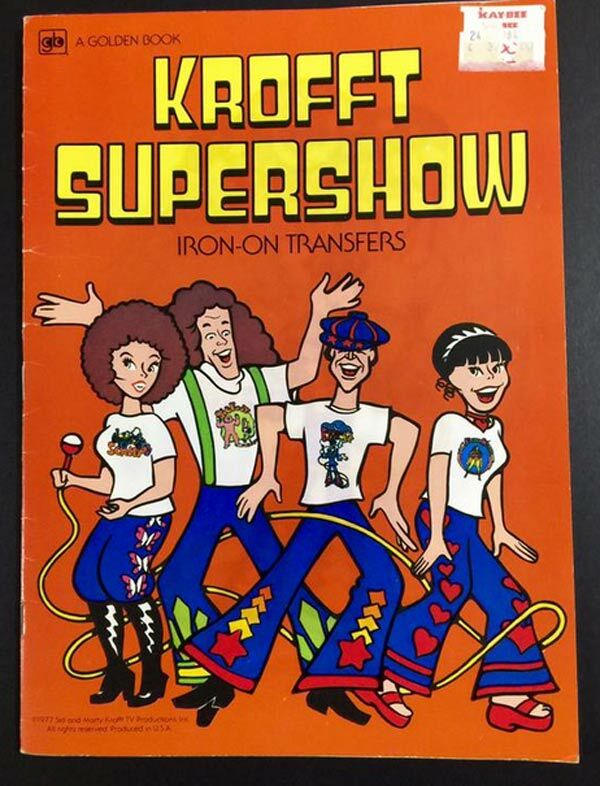 This page is from a Shoprite catalog, this is where a lot of my toys came from as a kid. 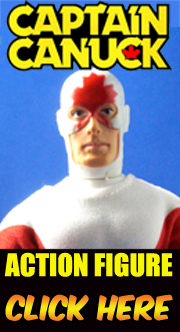 Check out the capeless (and very expensive)new character.